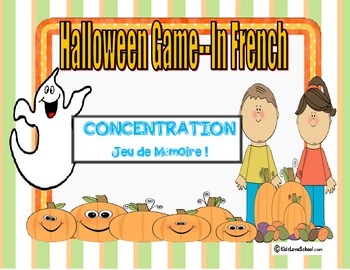 Halloween-Concentration (Jeu de Memoire) in FRENCH ! 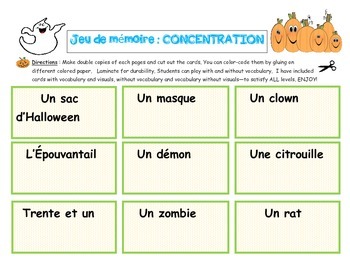 Are you looking for a Halloween game that promotes Halloween vocabulary but it FUN ! Look no further--This game is full of many options that can accommodate all classroom learners.Make double copies of each pages and cut out the cards. You can colour-code them by gluing on different coloured paper. Laminate for durability. Students can play with and without vocabulary. Students match up vocabulary or pictures. The student with the most cards is the winner. 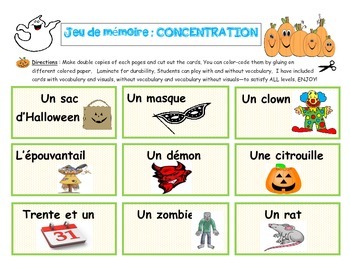 Cards cover all Halloween vocabulary imaginable! *This game is part of a Four Game Package available on my store. 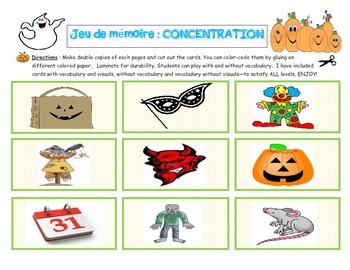 *Game is appropriate for both French Immersion and Core-- Grades 1-9.